2017 was hard. But maybe not difficult in a way that you’re thinking. It was an incredible “successful” year for us… but boy was it uncomfortable. 2017 forced me to stretch my comfort zone, hand off more than I ever have to team members, trust the process, and wait. 2017 was the year I had to let go of programs and services that were generating consistent revenue so that I could dedicate my time to investing in and educating my audience on an entirely new topic. In 2016 we focused mainly on helping creatives own and craft meaningful stories. As much as I loved this work, I was feeling called for something bigger. Ten years earlier I started sharing my own story and speaking to tens of thousands across the country… but I wasn’t helping others do the same. We would have to start from scratch and it was scary as hell. No one wants to start over, especially when things are going good. But we’re not called to do “good” work… we’re called to do GREAT work. I knew that working with creatives on adding speaking to their business was adding the most value to their businesses (and lives) but it was also the smallest part of my business in 2016. Something had to change. But in order to make the transition, I would have to step back from my income producing programs and educate my audience on our new focus - speaking! Sitting here a year later, I am so grateful that we took the leap and made the change. In 2017 alone, we helped hand-craft over 40 presentations for creative business owners and educated even more on how to do it themselves. I am HONORED to have been a tiny piece of their speaking journey and can’t wait to watch them blossom in 2018. One of the most rewarding parts of this was getting the opportunity to watch my students present their content IN PERSON. I spoke alongside a few of my talented clients and students at The Creative at Heart Conference and The Empowered Planners Conference. I knew it would be exciting to watch them come alive on the stage but I had no idea just how emotional I would get. Ya’ll! I was THAT coach in the back of the room… crying like a baby and snapping pictures like a proud momma at a ballet recital. Poor Chloe is in for a very embarrassing future. As we wrapped up 2017, I was shocked at how much had changed since our 2016 end of year meeting. Over the year’s time we were able to step out into the market and establish ourselves as THE Public Speaking Strategist for creatives. Even though I reduce the number of speaking engagements I was able to take on in 2017 due to a personal project I was working on (See: “Shattered” below) I was still able to take on a few very special speaking opportunities that were near and dear to my heart. Guest Coach/Presenter at Introvert’s Paradise - Reina Pomeroy hosted an intimate retreat for a select group of female business owners at a waterfront mansion in California. It was an absolute honor to be a guest expert at the event alongside the amazing Lacey Sites. Breakout Presenter at Creative at Heart - Creative at Heart is one of THE most sought after events my clients want to speak at. When Kat Schmoyer invited me to lead a session on ‘Speaking Made Easy’ I was over the moon. Not only did I get to experience the HEART behind this mission but I was able to watch my students and clients rock the main stage. The details for the 2018 conference will be announced on January 29th. Mark your calendar! I already got a sneak peek at the speaker line up and you’re not going to want to miss this. Keynote Speaker at The EmpoWEred Planners Conference - When my student Lucretia Williams told me she was not only going to add speaking to her business in 2017 but she was also going to host her own event, I was so excited to help her navigate this new territory. 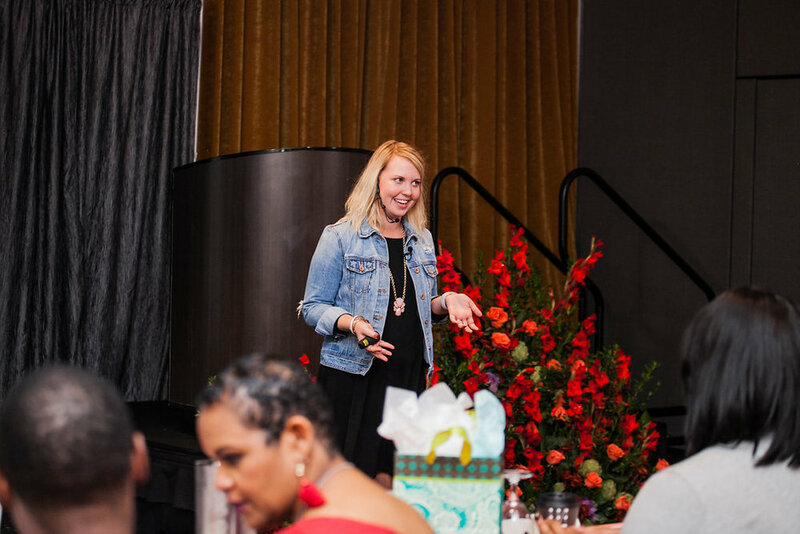 Delivering the keynote presentation was an absolute honor as The EmpoWEred Planners Conference didn’t miss a detail and you would have never known this was Lucretia’s first year hosting it. I can not wait to see what she has planned for 2018 as I know it will be an event to remember! School wide presentations at North Branch High School - Sorry, creatives… but North Branch was my favorite presentation of the year. We had been working for a few years to bring this presentation to Minnesota without luck. But the students and their teacher, Nicole Chandler, never gave up on making it happen. After funding and scheduling struggles, 2017 was the year we would finally make it happen as the North Branch FCCLA was awarded a grant to fund the event. In 2017 we introduced, launched, and sold out our signature program The Speaker Blueprint. Watching our speaker training expand from just one-on-one mentorships, to live group coaching and now a self-study edition has been overwhelming. I know the only way to really help our industry uplevel education at live events is to equip more speakers and hosts with the necessary tools and systems to serve from the stage. I can’t do that alone. But I CAN make more resources available. You can now access the self-study version of The Speaker Blueprint, here. I never really wanted to be an author… but I’ve always wanted to help others pick up the pieces after hardship. For eleven years I’ve wrestled with what words I would put on the paper if I ever did decide to share my story in print. 2017 was the year I let the words pour out. After many late nights, tears, second thoughts, and scraps of scribbled notes… Shattered was complete. We launched the book in September where it ranked as both an Amazon Best Seller and Hot New Release. It’s been four months and it still doesn’t seem real. We’ve sold and signed countless copies of the book. But some days (even with the stacks of reviews and testimonials) I have a hard time believing that ‘the book is on the shelf’ for someone who is looking for it… just like I was eleven years ago. You can learn more about Shattered and order your copy, here. Once the book was finished and the “what’s next?” questions began flood in… the conversation soon shifted to less about business and more about our family. At Chloe’s 4th birthday party in November, we were over the moon excited to announce that we’ll be adding a new addition to our family in 2018: baby #2. With a second kiddo on the way, what should we expect in 2018? I’m really trying to embrace ‘white space’ this pregnancy. I’ve been known to say “yes” to more than I should and overload my plate. I refuse to do that this year. Saying “no” is hard, but if I want to serve my clients to the best of my ability (AND grow a tiny human) I have to create more space in my schedule. We’ll be focusing on creating new resources and tools to help you add speaking to your business… but how we navigate things behind the scenes may shift slightly. Our 1:1 client roster will remain light (and by application, only) so I can give my clients everything I’ve got. Additionally, we’ll only be accepting new clients and in-person intensives through March. This will allow me to support my clients throughout my pregnancy and still allow for a peaceful maternity leave. The Speaker Blueprint will remain self-study with some excited new additions and edits coming in the next month. Why will we not be offering it as a live program this year? Because we’re shifting our live focus over to the alumni. That’s right, friend - continuing speaker education for our past student and Presentation Prep clients is here! I have found that our students and clients benefit the most from a little support along the way. Have you ever gone to submit a speaker pitch but wished you had an extra set of eyes on it, first? Have you ever received a speaking request but needed help figuring out the best way to respond? Our alumni and clients will be getting THAT - and it kicks off in just a week! The best part? This VIP roster will double as a resource for conference hosts who are looking for high-value speakers to add to their roster. Due to my growing family (and belly) I’ll only be taking on a very limited number of speaking engagements in 2017. Additionally, I’m going to try to bring my family along for as many of these events as I can. There are a few other exciting speaking engagement scheduled for later this year but we can’t share those just yet. What’s in store for your 2018? What is your focus for 2018? What changes are you making to help support that focus? Share below so I can cheer you on. In the coming months we’ll be especially focused on streamline systems, eliminating unnecessarily tasks and making the transition to maternity leave as smooth as possible. I can’t thank you enough for being a part of this journey and cheering us on along the way. And in case you’re wondering… baby #2 is a BOY!